We have a perception that universities exist to prepare us for our careers, and a reality that is somewhat different: Higher education is still as much about learning for learning’s sake as anything else. The result? Students feel like they were owed something that they didn’t get. After so much work just to finish a degree in the first place, they don’t know how to translate the skills they crafted over years of academic exertion into a paycheck…. There’s a lot of work to be done in transforming academia into something that effectively balances the need to pursue knowledge and build general skills with the need to effectively train generations of happy and productive workers. I sure don’t know what needs to be done, or if there is even an ultimate solution, but there are sharper minds than mine out there to address that issue. Two years later, this disconnect has arguably gotten worse, not better. In posts elsewhere, I’ve been pretty vocal about my feelings on the positive value of higher education (such as this piece for Career Options Magazine on the “value” of certain majors over others). Still, I have to admit that when it comes to higher education as a whole, I remain conflicted. I don’t really know what to think. There’s a heavyweight brawl of a debate going on right now as to the value and responsibility of post-secondary education in Canada, with solid blows being struck by either side. The key players in Canada –universities, employers and governments – are not working together to find a solution. Canada is the only country in the world without a national body responsible for education and is seen as one of the most decentralized and fragmented countries in the world when it comes to helping young people make a smooth entry into the world of work. The knock against universities is that they’re graduating too many students from areas of study that don’t fit the demands of the labour market – which is ironically facing shortages in many areas, technological sectors being a good example. One area that gets a special condemnation in Generation Jobless is teacher education programs, as in some parts of the country there are barely enough job openings for a third of graduates with teaching credentials. It begs the question: why then are universities continuing to accept, and indeed expand, enrolment levels in these programs if there are no viable jobs after graduation? Proponents of change will also point to the fact that universities are businesses, and as such their ultimate bottom line is not the employability of graduates, but the money that will allow the university to operate, grow, and remain competitive with competing institutions for students’ tuition. Meanwhile, a university education is the least affordable it has ever been (see post: “Paying For University: How Far Will You Go?“), and tuition costs are showing no sign of decreasing. The majority of students graduating from university do so with student loan debt, the average of which is $27,000. Something has to change, right? Whether it’s the necessity of university education itself, or the structure of that education. This is the question proponents of change are asking. Weighing in at a comfortable 91 kg, status quo has had a virtually unchallenged hold on the championship since it appeared on the scene so long ago. Mired in tradition, steeped in antiquity, higher education’s status quo has championed the relentless pursuit of advanced knowledge, the promotion of critical thought, and the production of the finest thinkers the world has known. Whatever is said about the labour market value of a university degree, the knowledge and personal development value of higher education is, has been, and will remain to be – to my knowledge – relatively unquestioned. The unemployment rate for 25 to 29 year olds is only 6%, slightly below the national average for the general population (this is more reflective of recent graduates than the “youth” rate, which includes 15 to 24 year olds). 40,000 more university graduates are working full time now than in 2008, and 80% of people under 30 are working full-time. There are many more jobs today than in 1990 that require a university level education (1.4 million, to be specific). Lifetime earnings continue to be higher the more education one has. On a provincial level, the Research Universities Council of British Columbia (RUCBC) has also posted a Labour Market Profile that points out that by 2016, BC will be facing a severe shortage of university-educated workers. 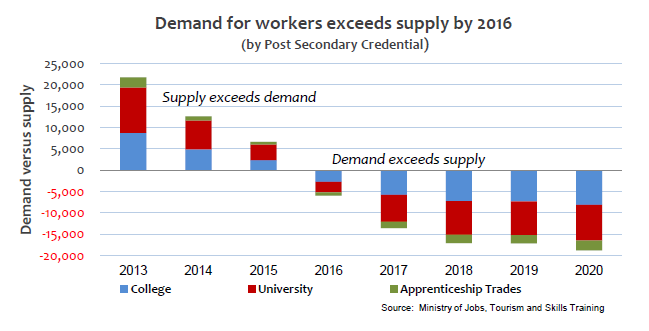 Among the report’s data (pdf) is the following chart, which illustrates the projected shortage nicely. I’ve been trying to wrap my head around this issue for a while, and sometimes I get close to feeling like I’ve got my position sorted out. But then something like Generation Jobless, and the debates it’s spurred, comes along and suddenly I’m re-evaluating my relative certainty. My being employed at a university complicates things further, as I surely have a fairly biased perspective as a result. To be sure, universities are still doing what they do well, and that is the production of graduates with a breadth of knowledge as well as important longer-term life skills like problem solving, critical thinking, and communication to name but a few. Unfortunately, I’m also quite sure that there exists a vocal group of students and graduates who are honestly struggling after navigating a post-secondary system they were led to believe would take care of them. So, there has to be a middle ground. Extremists advocating for the wholesale dismantling of the post-secondary system likely aren’t taking into account the massive labour market changes we’re about to go through, and the devastating effect that not having a properly functioning higher education system would have on economies all over the world. Still, improvement should always be strived for, and allowing labour market trends to influence policy in higher education is not the worst idea in the world. So we’re left with the question, how to improve? There are those who would argue simply to stream more students into “practical majors” like hard sciences, business, engineering, computer science, and so on, thus discouraging studies in the arts. I won’t spend time on explaining why here, but I believe that’s a terrible idea. So what are we to do? The thing is, we already know what works. Having seen time and time again the stark differences between those students who are able to transition seamlessly into the workforce after graduation and those that have difficulty, I have all the anecdotal evidence in the world for what changes can be made in universities to facilitate the career success of graduates (don’t worry, there’s real evidence too). Here’s my vision: Imagine a world where high school students actually found their career planning class enjoyable and useful. Imagine those classes were taught by qualified, motivated, and passionate career development professionals, instead of the less-qualified beginner teachers on the bottom of the educational totem-pole, desperate to teach a class, any class, to gain some much-needed seniority. Imagine every student in every university also took mandated career education courses in their first year, also taught by qualified career development professionals, so they knew exactly what to expect (and maybe more importantly, what not to expect) from their academic pursuits. Still with me? Now imagine that all of those students were required to complete – as a requisite part of their degree – multiple forms of experiential education. This could involve co-operative education, industry mentorship programs, project-based learning, volunteering, and the list goes on. These students would receive support from vital student services on campus (who are already running these programs, albeit on stretched resources) that would be integrated into institutional goals (is student success not a goal of most universities?). This would include at least one fully paid internship for every student, helping to offset a bit of the financial pressure of tuition, living expenses, and student loan debt. The result? Better prepared graduates, more partnerships with industry, and the activation of a portion of the labour market that is at present under-utilized (current students). Maybe it’s a pipe dream. I realize there’s a thousand questions related to the issue of how this gets implemented that I couldn’t possibly answer. But it has to start somewhere. I am a recent graduate with a Liberal Arts degree (Philosophy). I knew all along what I was getting into (debt, not being better prepared for a career, etc.) but I fully believe in education for education’s sake. That said, I regret it immensely. The cost was far too high for me, and now I am still stuck building my way up from the very bottom of a menial job, I am a better person and a more informed citizen because of my degree, but that doesn’t buy me food. If I wanted, I could dig the hole deeper, go on to graduate school, and roll the dice that whatever I chose would have a job ready for me when I finished, ready to dig me out of my debt hole. But even that is a huge gamble these days. I just don’t think we should have Universities as our job training centers and as our citizen-enrichment centers. I would love to see more emphasis like you suggest on career placement, because most of us (including myself) are completely lost after graduating high school before being pushed into a University. However, I also want to see more emphasis on Associate’s Degrees and job training as viable and respectable options past high school. Yes, going to college to learn for learning’s sake should be a major achievement again. For many people these days though, it’s just what is expected or an excuse to put off being an adult for an extra four years. When you factor in the incredible costs and the way Universities do typically run themselves like businesses, all of the issues only grow. I can’t remember the last time I was on a major University campus that wasn’t actively growing and building major projects, all the while tuition goes up dramatically to pay for those changes. It’s just a horribly broken system that needs dramatic revision and rethinking, in my mind. Hi Tyler – thanks for your very thoughtful comment and sharing your story! I definitely agree with your points, and admire that you can still see the value of your education, despite the less than ideal labour market you found yourself in after graduation. As for the system being broken, I think that universities are a pretty easy target these days. And I do believe that a lot needs to change in order for higher education to consistently produce graduates that feel competitive in the labour market – ultimately I also believe that universities will come around to this line of thinking and that we’ll see more to that effect in recruiting materials and so on (actually, that’s already started). But if we only focus on changing universities, without addressing the other key players as well (government and industry), then it’ll probably be for naught. The documentary was bang on on that point. I agree completely. Universities did not become what they are now in a vacuum. One of my biggest issues is the lack of apprenticeship-based entry into the workforce in our country. It exists, but is rarely promoted, incentivized, or publicized. There are just too many jobs that need people trained specifically for them without the addition of General Education requirements or even four years of incredibly expensive education. In that regard, we definitely have to look at how government, industry, and secondary education all interact with one another more than any one specific area. I came from Ukraine, and the point I’d like to make is that I’ve obtained my university degree in the Soviet Union. I know that the very name of the country gives you shivers, however, there was no a problem in the Soviet Union with university graduates who’ve got their education for the sake of education. ALL our degrees were profession specific, e.g. I have obtained Bachelor Degree in Special Education (as per UofT evaluation). In reality my degree had another name: Teacher for Children With Special Needs, Speech/ Language Therapist. Do you see the difference? THIS what Canada has to change. No bachelor Degree in Business Management that worth NOTHING without experience. And where the experience comes from? Assembly line in a factory? I currently am an Employment Advisor in Toronto, so I deal with this kind of frustration every day when I have recent graduated from universities. Hi Maryna. Great comment! (And you’ll be happy to know I don’t get the shivers from hearing about the USSR. Actually, my maternal heritage is Ukrainian! I believe my great grandparents emigrated from Ukraine/USSR in the early 1900s). It’s amazing how even the name of a degree can suggest a more industry-focused mindset. I’ve seen and heard similar tales from international students here from many different countries around the world. It’s funny – we do have a sort of national pride, and perhaps an international reputation, for valuing education, and I hope (though I can’t say that optimistically, given the current administration’s patterns when it comes to domestic policy) that we can wake up and implement some positive changes before it’s too late. Yes, we do have a well-educated population, relatively speaking. But that won’t mean much if it doesn’t translate to happy, meaningfully employed citizens. David you read my mind! Your vision is what I’ve been thinking for a while! High School Career Counsellors are often not properly trained and are understaffed (usually very understaffed – ration of 1 to 100 or more). I think the professional title of CO (Conseiller d’orientation) in Québec where a master’s degree in guidance counselling is necessary to become a member is an interesting model that many other provinces should look at. That being said, these professional career counsellors are also very often understaffed and underutilized by highschool and cegep students. I agree with you that something mandatory should be explored. In sum, thank you for your great post! Thanks Marc-Andre, and good points! I didn’t mean to belittle the work that teachers/HS counsellors are doing in secondary education – I have a brother and sister-in-law who are both teachers and I’m sure would have something to say about that! I’m confident that many are doing good work, but there remains the problem of being under-resourced, as you say, and likely having to act within the confines of an outdated and likely biased curriculum. So while Quebec’s model is indeed fascinating I suspect it would only address one part of the equation. Fascinating to hear about that trend in the UAE! Thanks for the perspective, Gillian. Indeed the complexity of the issue is worthy of research; I observe that collaboration across sectors (educators, career counsellors, community members (parents and students), and government is essential and is what has been lacking – to my eyes…experts point to the ‘other’…it is so much more complex than any single perspective. I work with students, graduate and undergraduate, and have spent years exploring what’s happening in our ‘global networked knowledge economy’, higher education administration and curriculum development and implementation. I think that what students need is support with their own identity development process, opportunities to understand and experience the relevance and importance of their theory based courses in the real world. This means experiential learning of many varieties but always encouraging/requiring reflection, mining their understanding of themselves and the skills they are developing/need to develop, the community, business or environmental problems they are working with, and an understanding of the global context, all while applying their theoretical understanding to real world problems and situations. No small project…thank you so much for bringing this topic here David! Great point Janet – experience without reflection is indeed often a missed opportunity for identity/career development. Thanks for your comment!